Philippines – The IE 800 headphones from Sennheiser are the ones with the most innovations per square millimetre. And for precisely that reason, these small in-ear earphones can certainly compete with much larger high-end headphones. They are brimming with groundbreaking ideas to ensure that audiophile music lovers can get as close as possible to perfect sound even when they’re on the move. When it comes to audio quality, ear-canal phones have been known to come up against their limits in the past. But the IE 800 sets new standards: with its new model, Sennheiser is now rounding off its top segment with a set of genuinely high-end portable headphones. “The sound of the IE 800 can easily compete with that of our high-end portfolio," said Maurice Quarré, Director Product Lifecycle Management Sennheiser Consumer Electronics. These dynamic in-ear phones offer fascinatingly brilliant trebles, precise bass response and a detailed, lifelike sound image with a frequency response of 5 to 46,500 Hz. The IE 800 not only boasts innovative technology but also features a modern design and high-quality materials such as the scratch-resistant ceramic housing. Its puristic design language and black/silver finish give it that certain extra. The high-end earphones were developed and designed at Sennheiser's headquarters in Germany. And the new in-ear earphones will be produced here too. The interior of the IE 800 conceals many small but effective innovations: the centrepiece is Sennheiser’s specially developed Extra Wide Band (XWB) driver. With a diameter of just 7 mm, it is the smallest wide-band sound transducer currently available in dynamic headphones. Its functional principle guarantees distortion-free sound even at high sound pressure levels. "Until now, high-quality in-ear headphones have used so-called balanced-armature multi-drivers,” explained Senior Acoustic Engineer Axel Grell. “Reproducing the entire audio spectrum requires several narrow-band drivers to be operated in parallel. However, this results in very slight jumps and delays in music reproduction." By contrast, the miniature-sized XWB driver developed by Sennheiser is able to perfectly reproduce the entire audible frequency spectrum and beyond. The advantage: music is played back with crystal clarity and with absolute time precision. The endeavour to fully exploit the sound potential of the premium headphones led to a further small but highly effective innovation: a vented magnet system. The idea is actually quite simple and was used for the first time on the HD 700 high-end headphones. “The oscillating motion of the diaphragm produces an air flow in the magnet system housing that causes the diaphragm to wobble slightly,” explained Axel Grell. “By positioning two precisely defined vent holes in the housing directly under the magnets, we can cause the air to flow in a specific direction. This minimises the wobbling motion of the diaphragm and reduces total harmonic distortion to less than 0.06 percent. 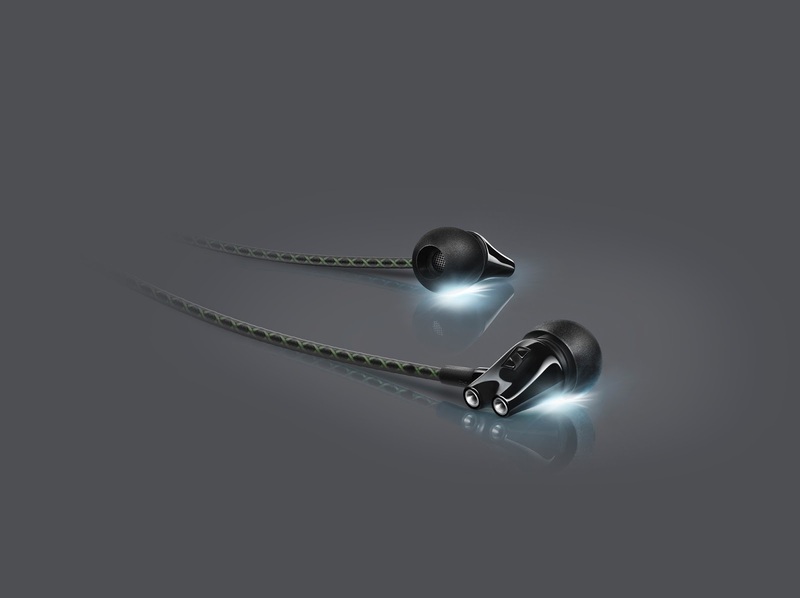 With the IE 800, Sennheiser has succeeded for the first time in solving what is known as the ‘masking effect’. This effect, which has a negative influence on overall sound quality, is due to the way in which our ears work. “The human ear is unable to perceive low-volume frequency components of a sound if there are much louder sounds occurring in a lower frequency range at the same time," explained Axel Grell. "This means, for example, that very loud low-frequency sounds will ‘mask’ very quiet sounds in the medium frequency range. This is particularly apparent in in-ear headphones. The sealing of the ear canal by the earphones normally causes resonances that result in a peak in the 7kHz to 8kHz range. This has the effect of masking the actual higher-frequency components. Precisely this problem has been overcome in the IE 800 by the use of an absorber. Sennheiser’s patented dual-chamber system absorbs the energy of the resonance, thus preventing any unwanted peaks. As a result, all frequency components – even the finest nuances – in the music material become audible. The optimum sound properties of the IE 800 are further enhanced by excellent wearing comfort. The housing is made of scratch-resistant, skin-friendly ceramic, while the ear pads consist of skin friendly silicone. This rules out any risk of allergies or skin irritation. To guarantee a perfect fit, Sennheiser has developed new ear adapters with an oval shape based on extensive international studies in ergonomics. According to their personal preference, users can choose from a selection of oval (SM/ML) and round (S/M/L) adapters. A protective mesh on the ear cushions effectively protects the drivers against dirt contamination.